Dowker island is an uninhabited island in the St-Lawrence river near the south western end of Montreal island. 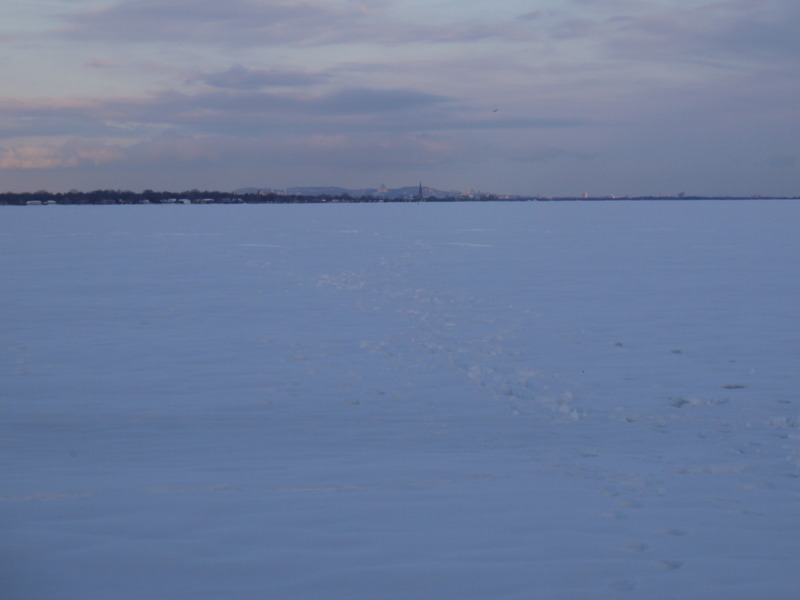 In winter you can walk to the island over the ice. It's a nice walk if the weather is good. 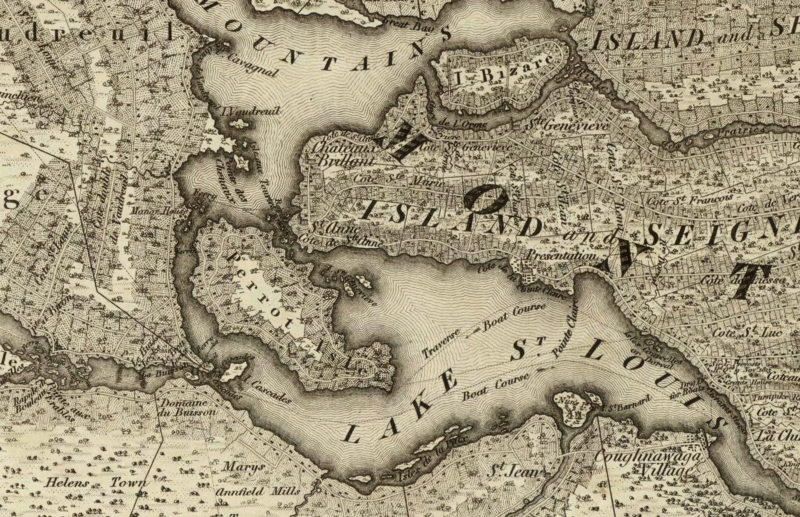 It's about 1km form the shore lines of Beaconsfield and Baie-d'Urfe. 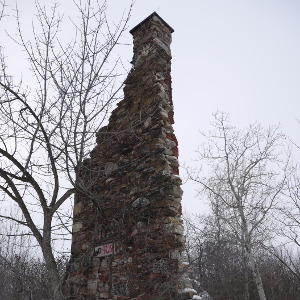 Leslie Dowker used to live on this island and ruins of his house as well as associated buildings are still there. It's and exciting place and children love to explore the old stone ruins. The ruins are near the north-east end of the island. It's only about 1km from the shore but don't underestimate the distance. 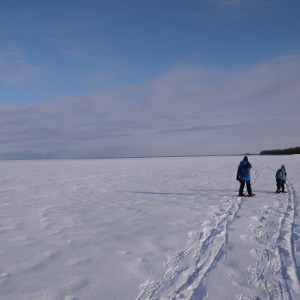 The wind on the open ice can be much stronger and walking through deep snow can be demanding. Choose a day with the right weather condition and make sure the ice is strong enough. 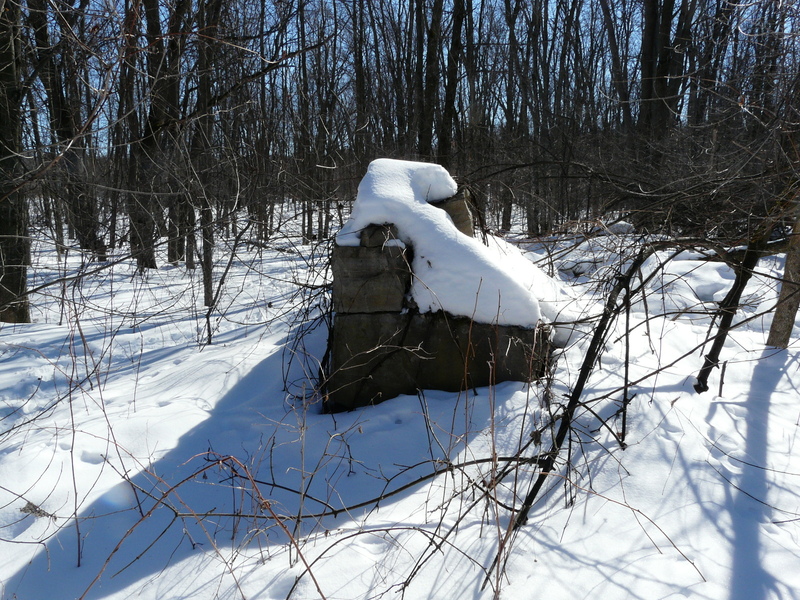 A cold, sunny February day with no wind is what you are looking for. 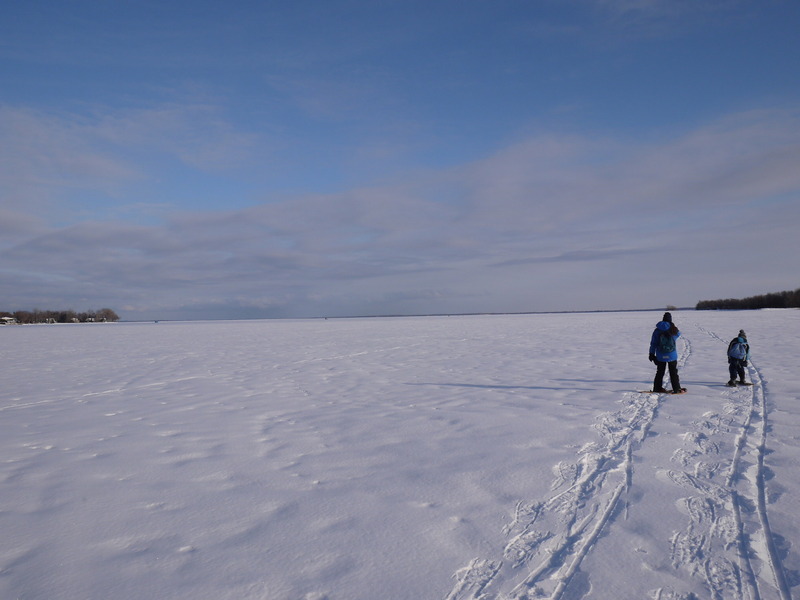 At least 2 weeks of continuous temperatures below -10'C are needed for the ice to be safe for walking. 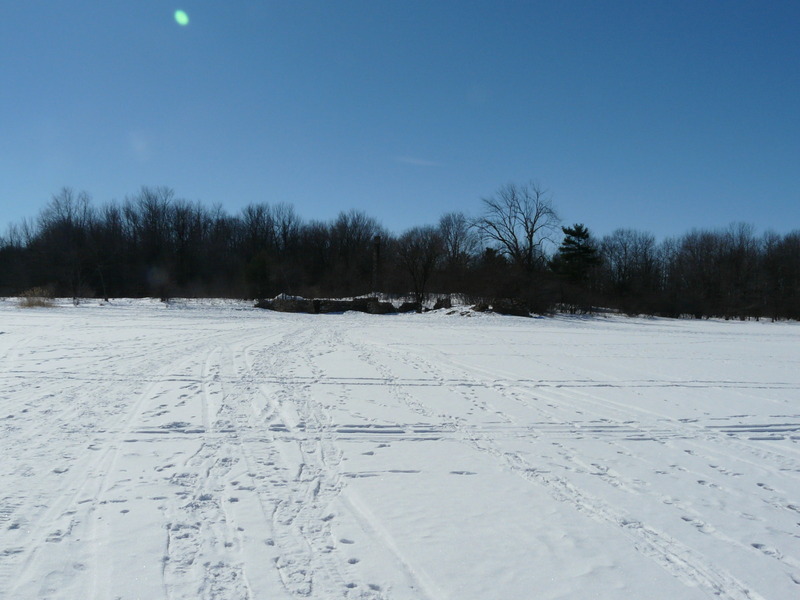 There are almost no currents in this area but it is still a river and moving water does not freeze as easily as standing water. Mount Royal and parts of the city of Montreal in the distance. The water around Dowker-Island comes from two different sources. 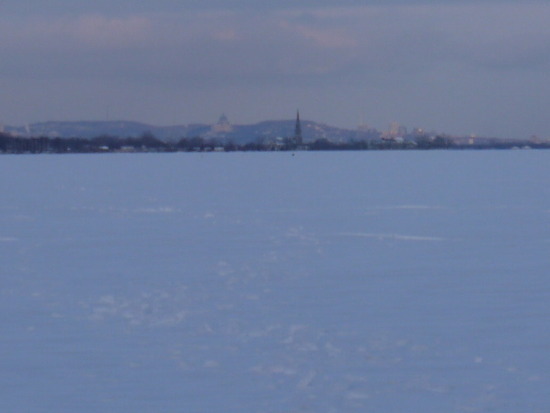 The water on the North-West side is from the Ottawa River where as the water on the South-East side is Saint-Lawrence River water. This can be seen in the following aerial image because the color of the water is different due to temperature, sediment and algae differences. 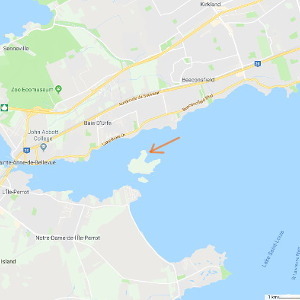 The more brown water seen in the aerial image comes from the Ottawa River while the blue green water is from the Saint-Lawrence River. 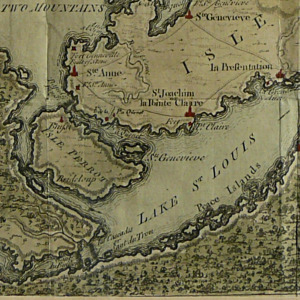 Dowker Island was granted to the governor of Montreal, François-Marie Perrot by Nouvelle-Frances intendant Jean Talon in 1672, along with Île Perrot. 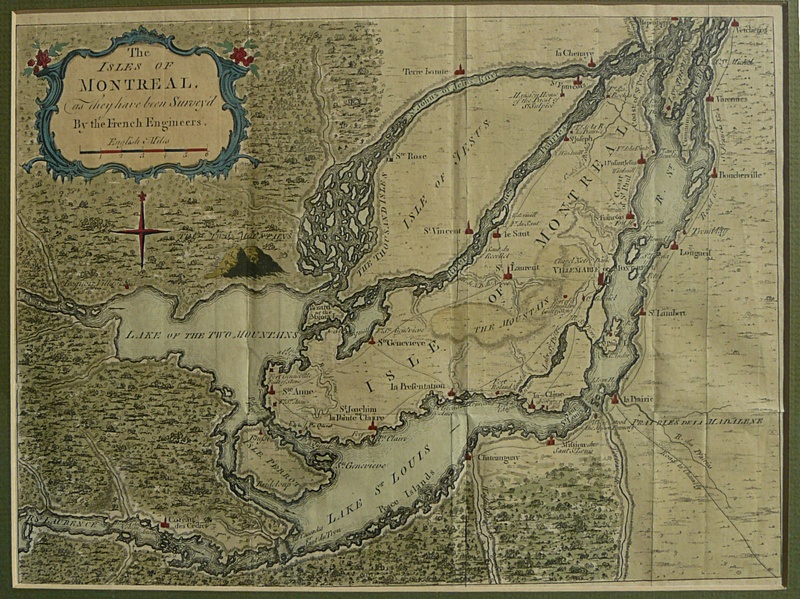 It was then known as Île Sainte-Genevieve. 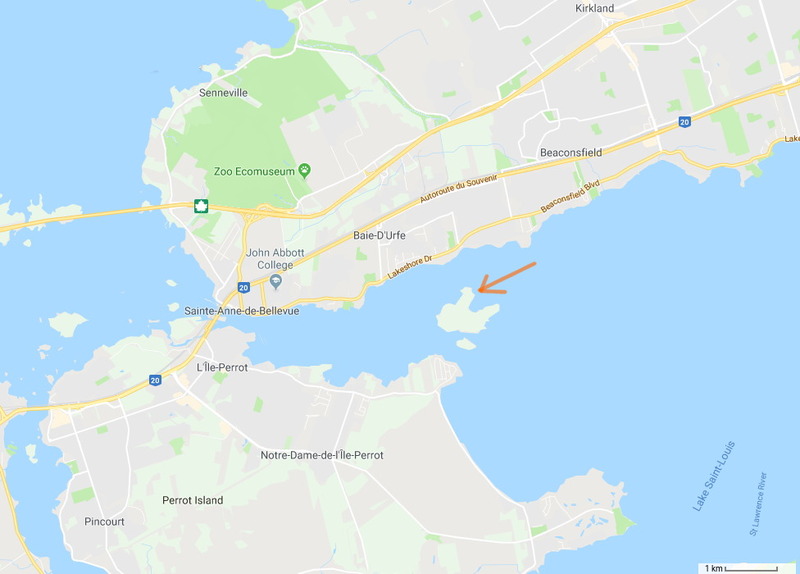 Although near the towns of Baie-d'Urfé and Beaconsfield, it is administratively part of the municipality of Notre Dame de-lÎle-Perrot. 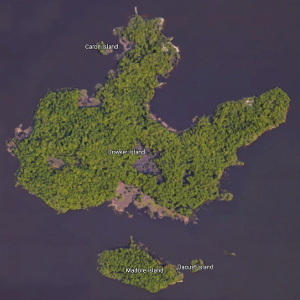 Dowker Island is marked in some older maps as "Lynch Island". 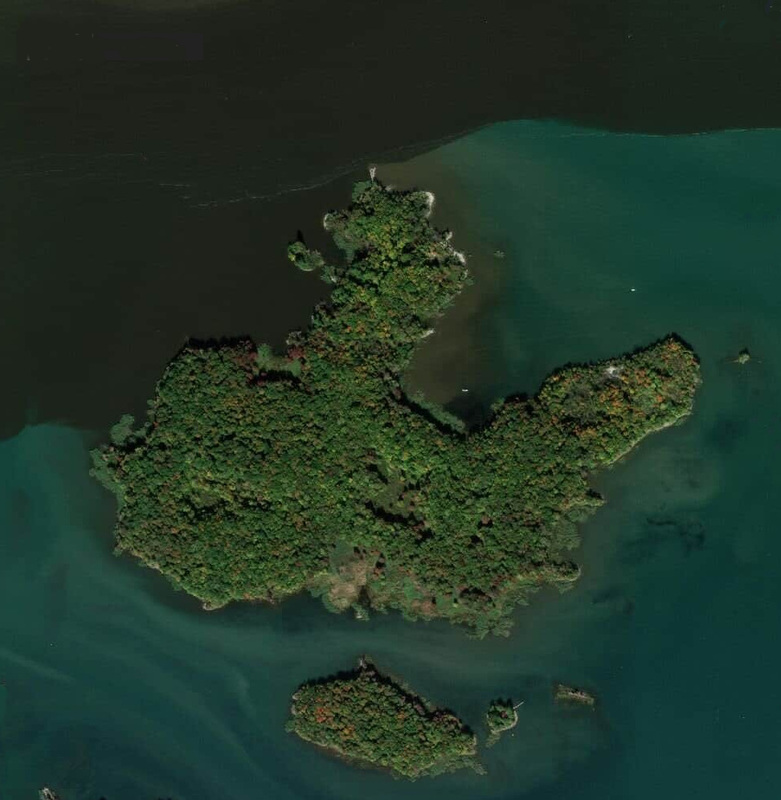 Dowker Island is today (2019) an uninhabited island. 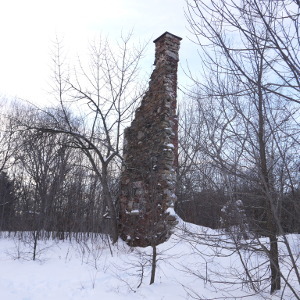 Leslie Rose Dowker bought the island in 1887, he built himself the stone house on the north east side of the island and he lived there until his death in 1945 (20 Feb. 1945). 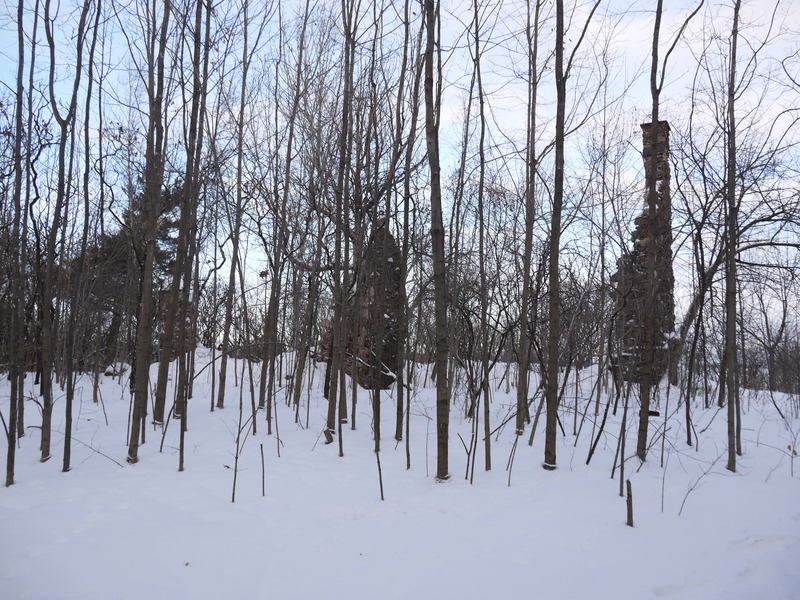 Leslie would go to his island house on the weekends, both in summer and in winter. Leslie. 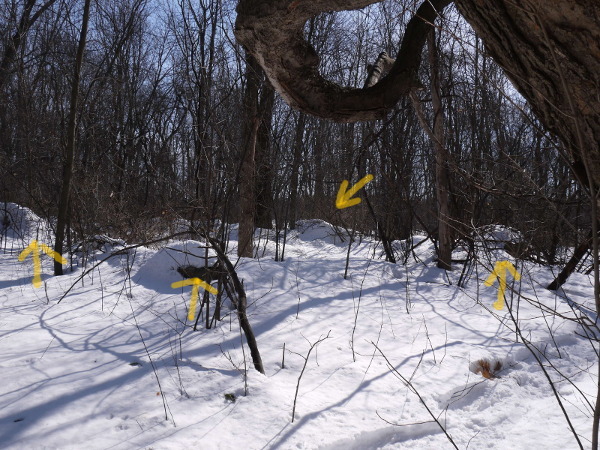 R. Dowker had a right of way from Lakeshore Drive in Baie-d'Urfé via the lot between 20100 Lakeshore and 20094 Lakeshore (opposite Apple Hill road). 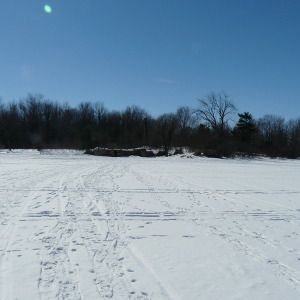 In early winter or in spring time he would pull a light weight boat behind him in case the ice was too thin and gave way. He loved his island and he spent most weekends there. He would give big parties on the island. Leslie Rose Dowker was the brother of Baie-D'Urfé's first Mayor, Vivian de Vere Dowker. 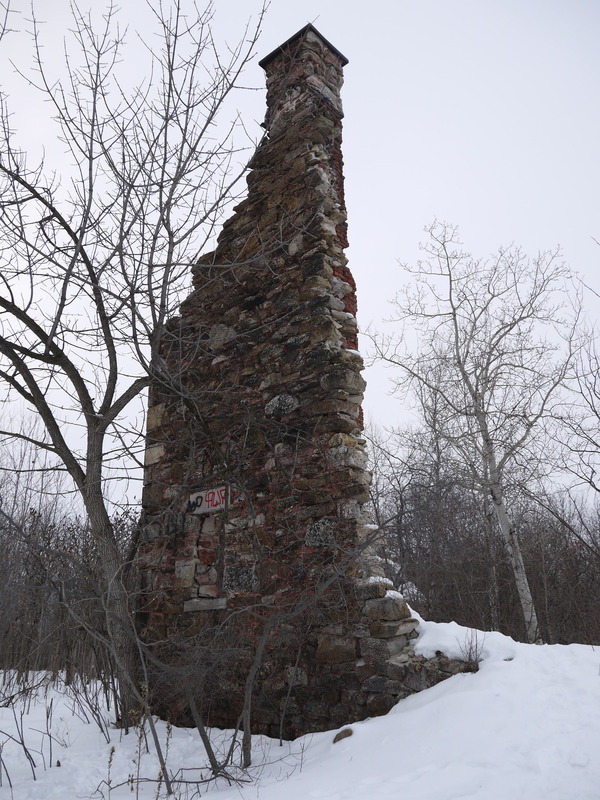 Leslie Dowker's house was damaged by a fire in 1960. 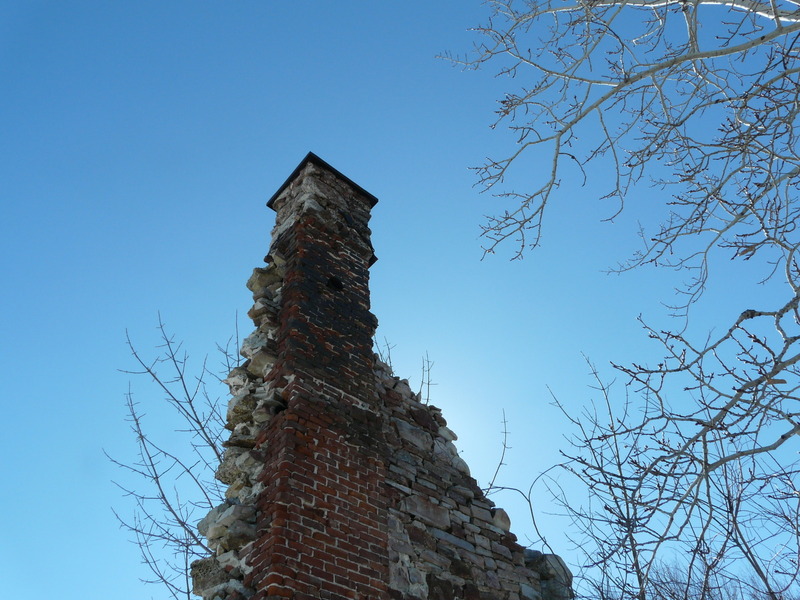 It was repaired and renovated a few years later. 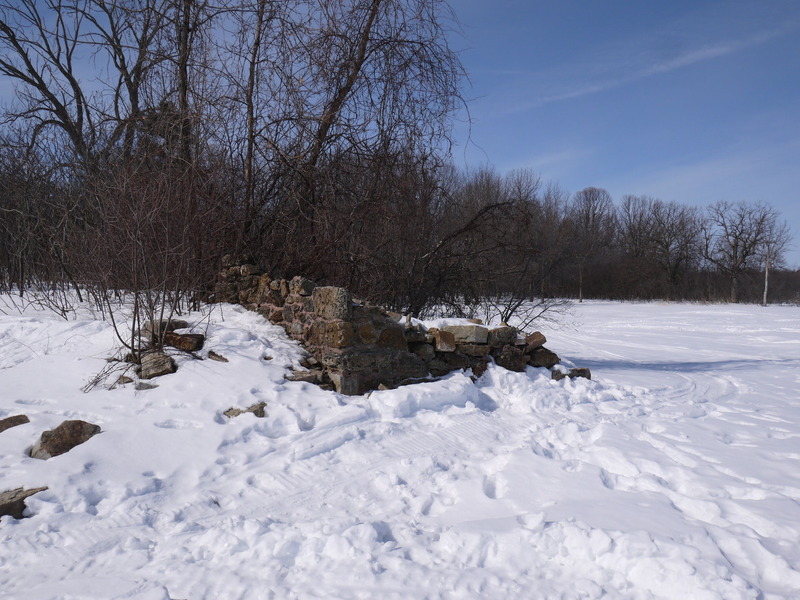 There was as well a barn and storage building with stone fundations towards the west (about 100m from the house). On the east side he had by the boat dock a small square stone sched. 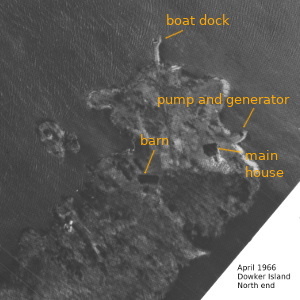 North end of Dowker Island, aerial photos from April 1966, October 1969 and May 1975. 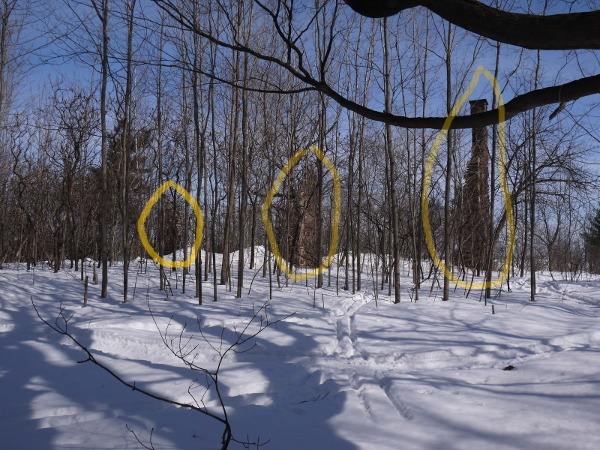 In the mid 1970's two houses existed on Dowker Island. 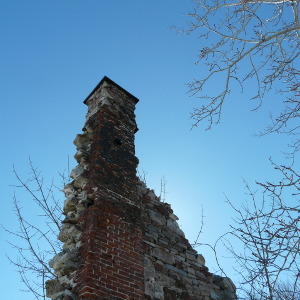 The original Leslie Rose Dowker stone house, repaired and renovated, and a small summer cottage on Caron Island which is a tiny island on the west side, almost connected to Dowker Island. The 1975 photo shows a small cottage on Caron Island. 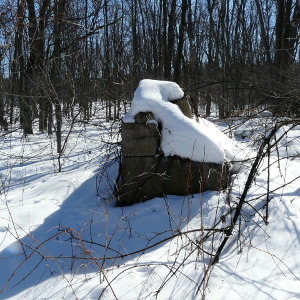 It was demolished in the late 1980's. 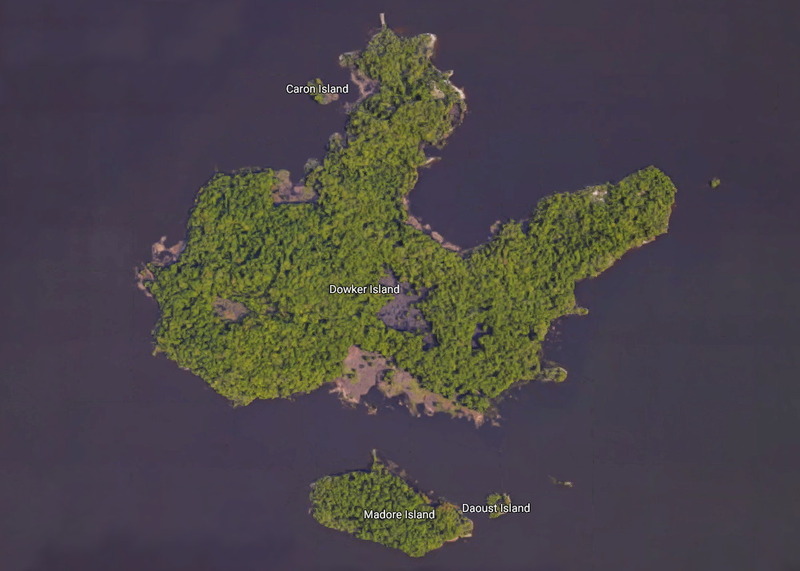 One can walk from Dowker Island to Caron Island through waist deep water. 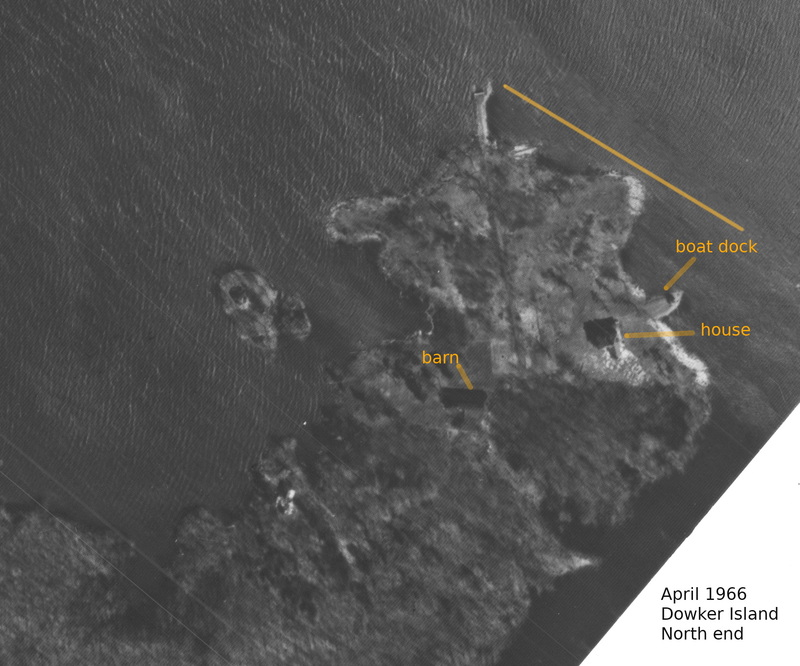 A round structure is visible on the 1966 picture of Caron Island. I am not sure what it was. 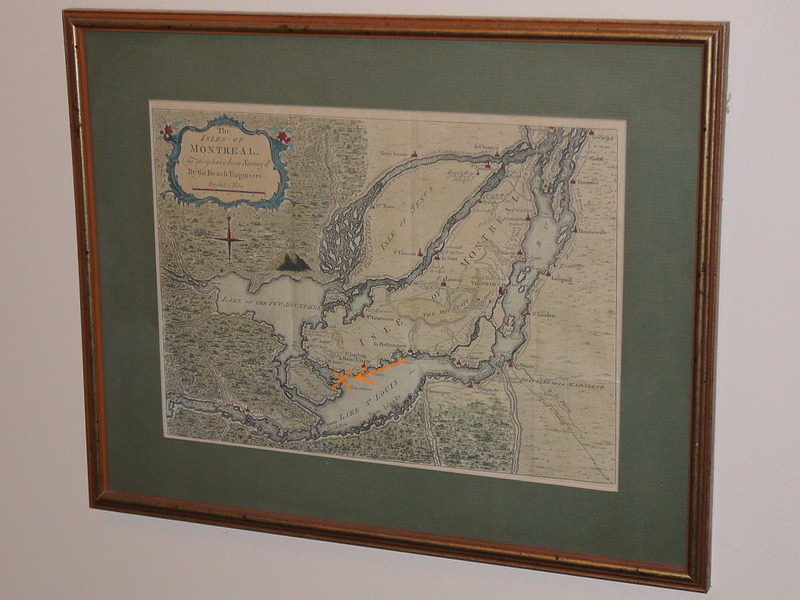 Old navigation charts mention a red navigation aide light on the north end of Dowker Island. 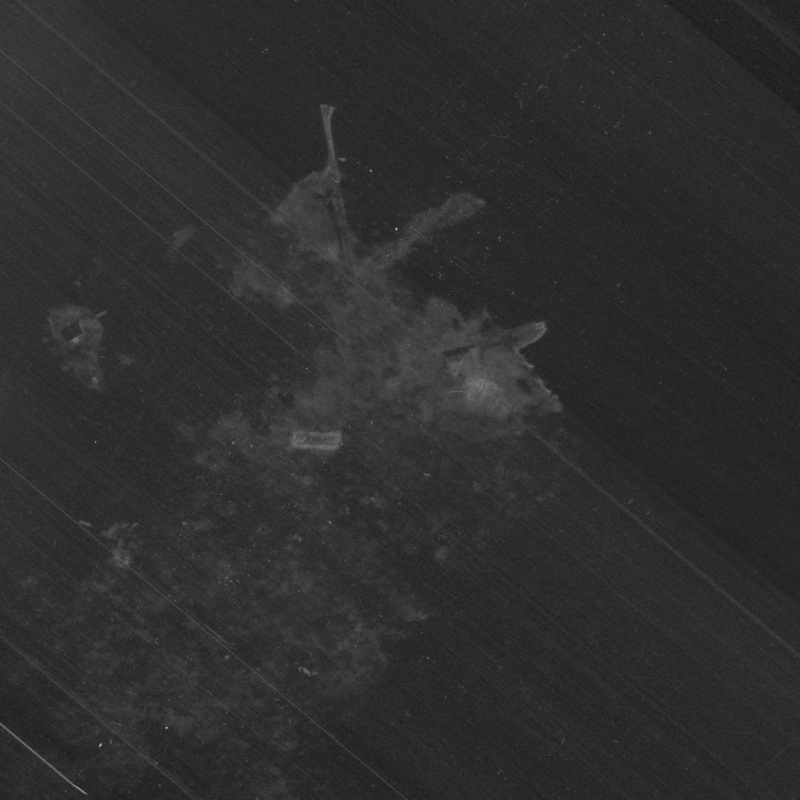 It was presumably located on the north tip of the island and a small black spot is visible in the 1966 aerial photo. 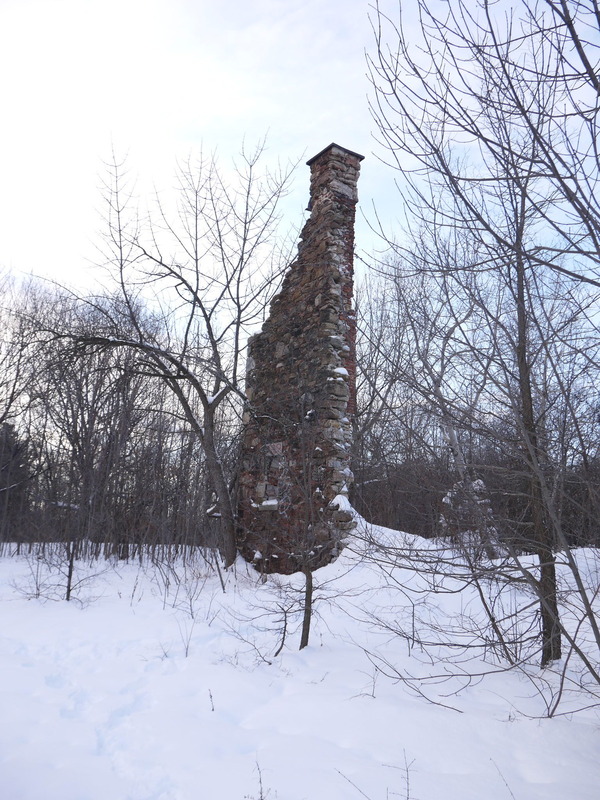 What remains today are the ruins of the Leslie Dowker stone house which was damaged by a second fire in 1985. Some of the stones that where part of the barn and storage building can still be found as well as parts of the walls of the square shaped sched by the boat dock. The island is now zoned such that no more new construction of any sort is allowed. 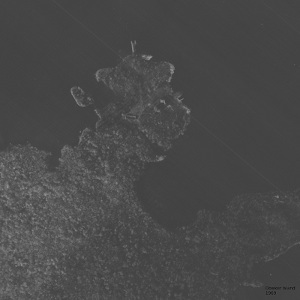 The island is mostly flat with just minimal elevation above the water. 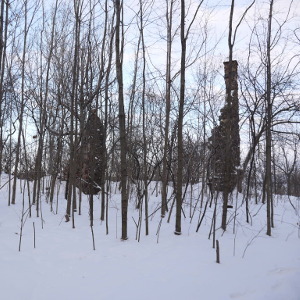 It floods every few years when there is extended rain and a major snowmelt in spring. 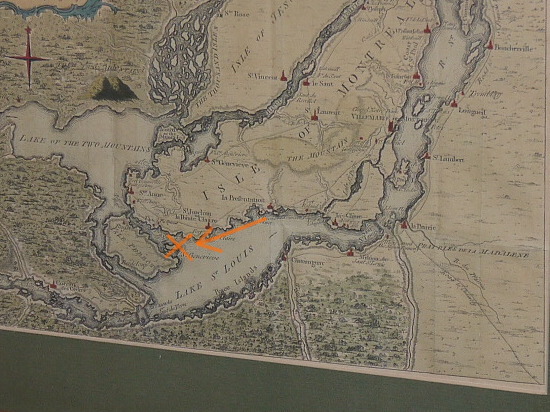 The water levels in the St-Lawrence river used to be lower in the past. The water levels were increased in the 1950's to make shipping safer. 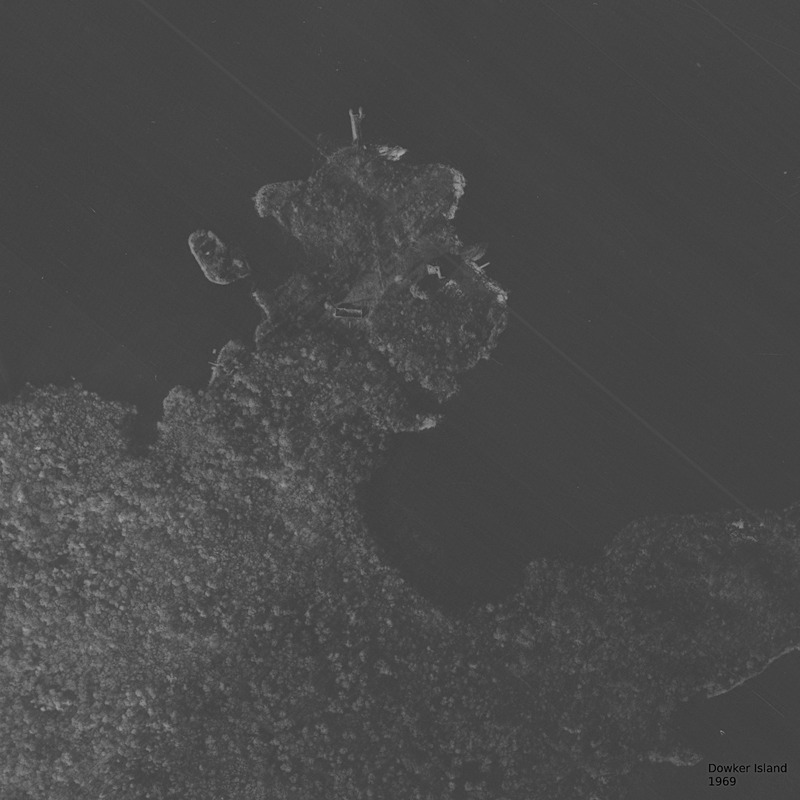 This is one of the reasons why older maps show a lot more smaller islands. 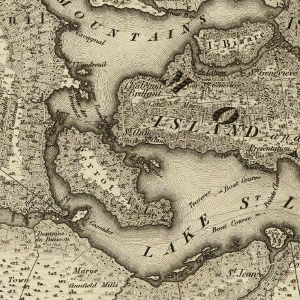 Leslie Dowker's island did probably not flood during his time. The Baie-D'Urfé history book: "Baie-D'Urfé 1686 - 1986", ISBN 2-9800651-0-2, pages 52 and 65.